A rather unconventional group, both in their line-up and overall sound. They were founded by Freddy Brua in 1973. Wapassou's first album was dominated by his eerie organ sounds, the violin of Jacques Lichti (struggling in the intonation) and the feeble vocal contributions of Karin Nickerl. They didn't use bass or drums. The most accomplished piece was "Trip", which featured four guests in what sounds like a hilarious jam session featuring sitar, tablas and drums that was a lot of fun! Obviously edited from a longer session, it has some barely audible cuts. Overall, an interesting album that just didn't succeed. Messe en Rй mineur (1976) was a vast improvement on which their sound came into its own with a consistent instrumentation of farfisa organ, synthesizer, acoustic or electric guitar, violin and high-pitched, wordless chanting. This ethereal and spacey music has some similarities to Catharsis (their organ sound), the German Popol Vuh (the meditative aspect), the softer parts of Amon Düül II (with weird guitars and Renate Knaup's vocals) and Italian Opus Avantra (their strong connection to classical music), but it is as idiosyncrastic as all of these. The "Mass in C minor" goes over two record sides through different dreamlike and associative phases, without really concluding. This kind of stationary music is related in its form to the German "kosmische musik", but has an added element of late 19th Century French romance. Naturally, Wapassou stuck close to this formula on their two subsequent albums. 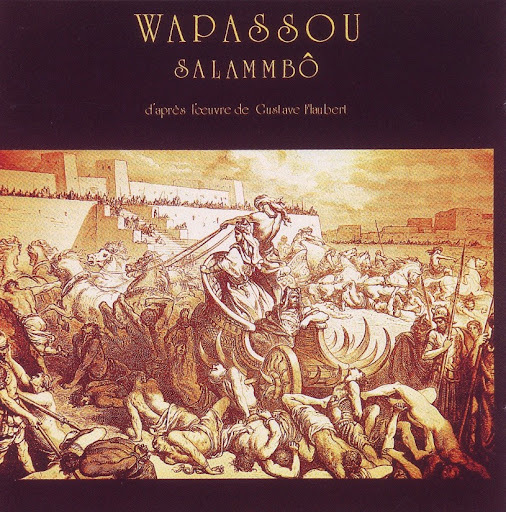 Salammbф (1977), the musical description of a novel by Gustave Flaubert, featured another female singer and the famous record producer Jean-Pierre Massiera in a cameo spoken role. Equalling the quality of its predecessor there was also a more melodic content hidden in Wapassou's soundpool this time. Ludwig (1979) revealed itself on the sleeve to be the last part of a triology, representing life (Messe en Rй Mineur), death (Salammbф) and eternity (Ludwig). Its content was more influenced by classical chamber music and suggested that they were now passed their creative zenith. Later albums have confirmed this and Wapassou are best remembered for their excellent opening triology.